Tuscaloosa twister killed dozens in university town, spared credit union employees. 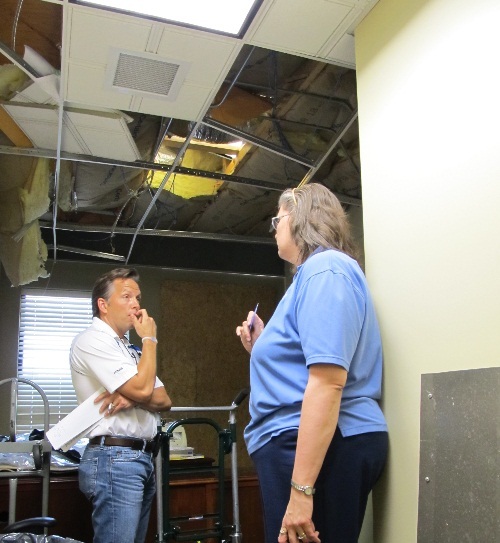 Becky White of DCH CU in Tuscaloosa discusses tornado damage with Patrick La Pine, CEO of the League of Southeastern Credit Unions. The 17 employees of the $33 million DCH Credit Union of Tuscaloosa, Ala. will not soon forget the 10 minutes they spent huddled in two bathrooms of their building April 27 as 150 mph tornadic winds shook the structure, shattering windows and scattering debris.